My lips are dry all year round. Plus when I'm anxious or stressed I bite my lip which really doesn't help when wearing the berry lipsticks that I am in love with. So here are some lip treatments that keep my lips smooth and hydrated and in the best condition I can get. 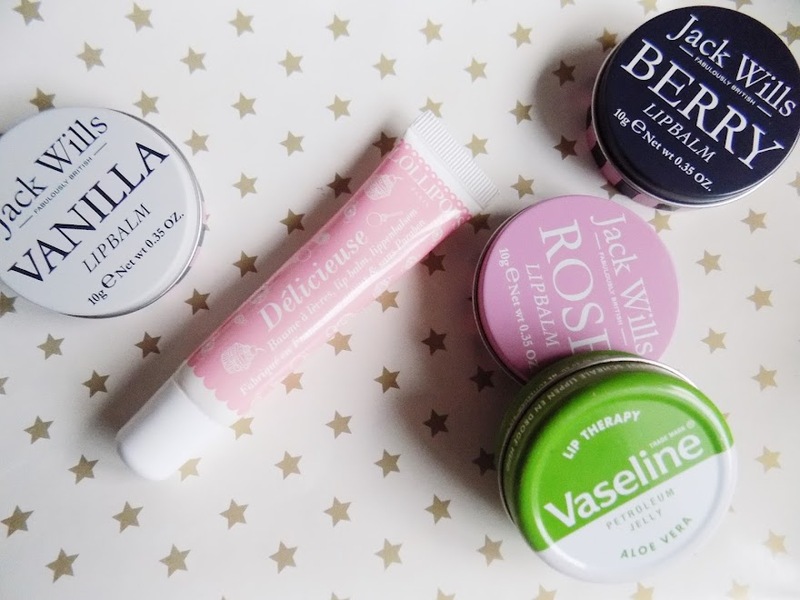 A hydrating lip balm is also a great product to have in the colder months. Chapped lips are caused by the colder climate but also going from hot to cold environments like your home and then outside. So a lip balm is something I carry around in my pocket at all times. 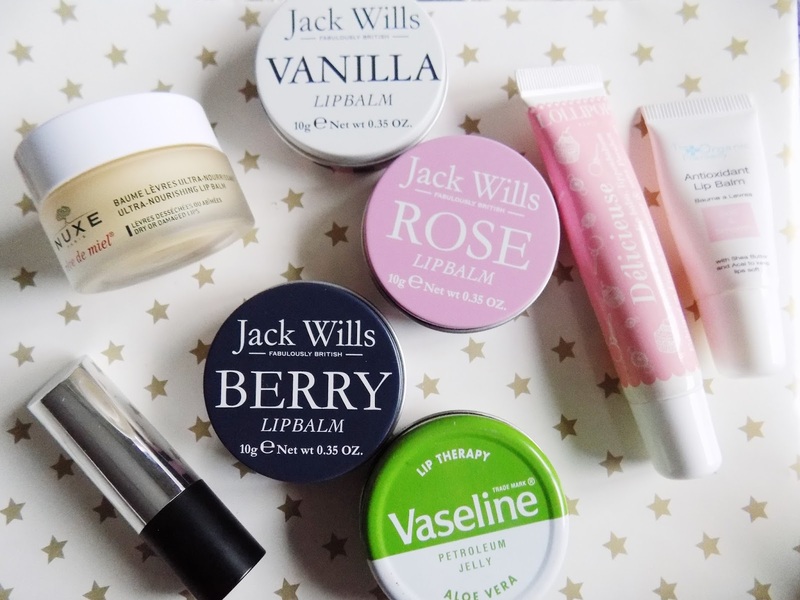 My current favourites are the Jack Wills Lip Balms, there's 3 different scents in the pack (£8), Vanilla, Rose and Berry and these are so moisturising and make my lips feel really soft and smooth. The Lollipops Delicieuse Lip Balm is another favourite and I prefer the packaging of this as I don't have to stick my finger in a pot which is just so unhygienic and gross. It smells great, it's more of a thick balm compared to the JW Balms but it is a really great one which you can purchase on the Glossybox website here for only £4.15. Vaseline is a very underrated product but it really can help with chapped lips. It's great to put on before any lip colour. Although it doesn't do a huge amount in regards to hydrating, it's great for softening and smoothing your lips. 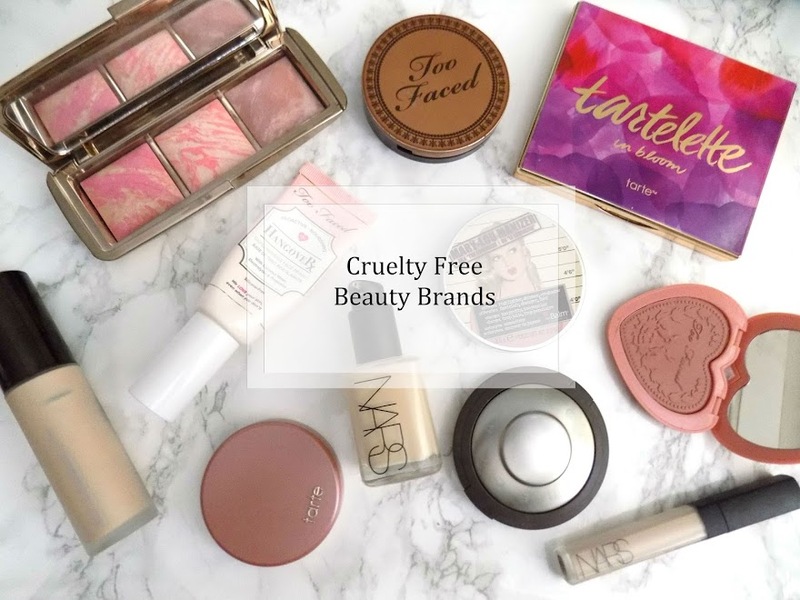 I prefer the Aloe or Rose but whatever the scent, it's an essential in my makeup bag. 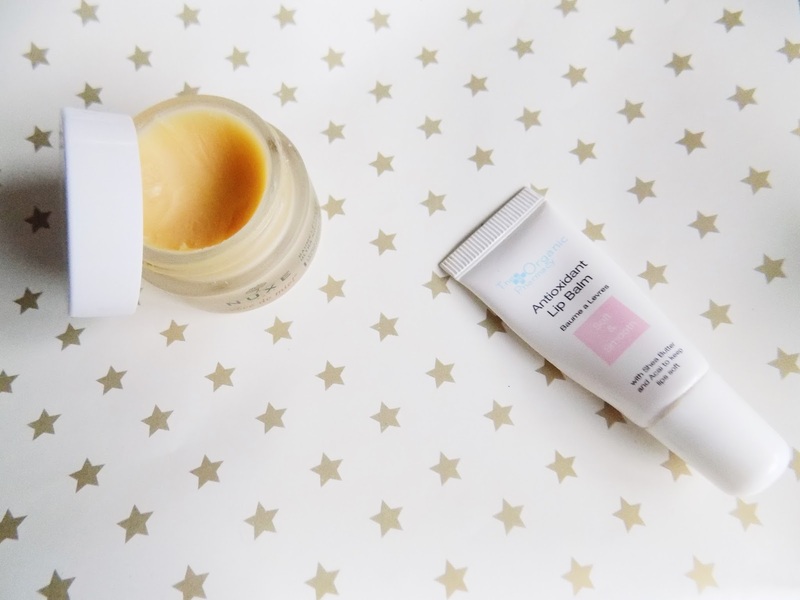 A lip exfoliator is something I think has a massive part to play in the Autumn and Winter and the The Body Shop Lip Scuff is the best one I've found. 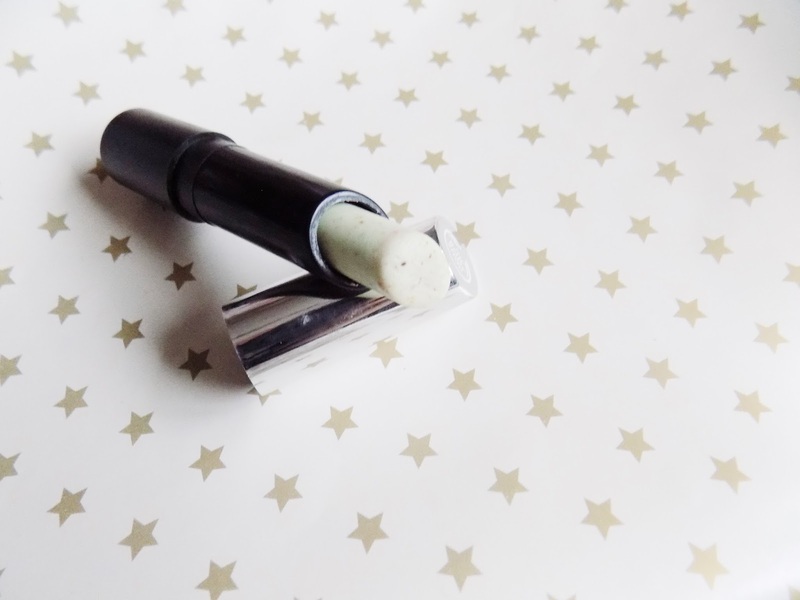 It's in a lipstick form which makes it super easy to use and just apply on the the lips. Once I've applied a good amount I use my finger for an extra exfoliation. This gets off all dead skin and smooths the lips. This can be used either first thing in the morning before you put on any other lip product, or when taking your makeup off at the end of the day, or even just before you go to bed. It's so easy to use and you don't need anything other than this and your finger. As for a hydrating treatment for my lips, the Reve de Miel Lip Balm is my overnight lip balm which hydrates, smooths and moisturises. It's a thick consistency almost like a butter, and it leaves a matte finish and although it's £9.50 it is definitely worth it to me - especially in the Winter. This is a must have for my bedside table. If that isn't your jam, then the Organic Pharmacy Antioxidant Lip Balm is a great alternative as it's more of an oil texture and it hydrates and softens with a light weight feel to the lip. The full size is £12 so it's a pricey lip balm, I got this as part of a sample pack with Elle Magazine, and I am in love with this. If you haven't got access to a lip scrub then you can create your very own lip scrub using some honey and sugar. Simply pop a drop of honey onto your finger and mix a bit of sugar in with it and apply to your lips and scrub all that dead skin away. It's so easy and quick and it makes the world of difference to how your lip colours apply and wear on the lips. I hope this has helped if you're having some difficulties with chapped and dry lips and if you have any other lip treatments or balms that you love then please let me know as I am always trying lip balms. What is your favourite lip treatment for Autumn/Winter?